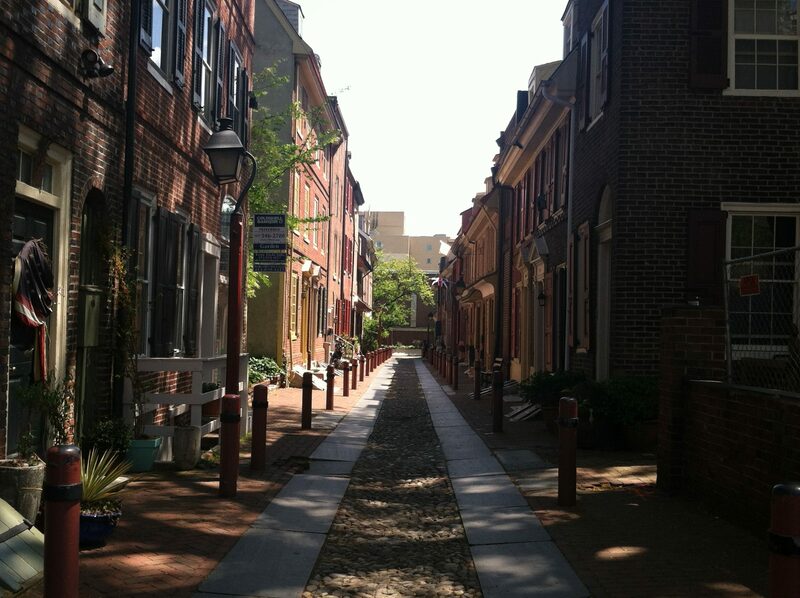 One of Old City’s most endearing sights, Elfreth’s Alley is the oldest continuously inhabited street in the United States, with its oldest buildings dating to 1728. People have lived in these houses ever since. It’s densely packed, as the “alley” part of its title would lead you to infer. There are even small alleys that stem from the main one, where houses and plants are located. The houses themselves are decked in Georgian style, the most common architectural style in colonial America. Some maintain original aspects of the house, such as flowerpots and shutters. One even has a British flag on the first floor. The houses are also among the few working-class houses from colonial Philadelphia that still exist, as most have been demolished over the years. There is a small museum, which consists of two houses, that is open to the public. Here a tour guide leads visitors through a reconstruction of what these homes were like in the 1700s, as well as telling of the lives of some of the people who lived on Elfreth’s Alley. The houses are open to the public twice a year; once before Christmas, and once in the early summer. You can walk down the Alley, and no admission is necessary. The museum, on the other hand, is $5 for a guided tour.